Just a short note about a very vibrant grasshopper population that I found in this otherwise strangely grasshopper poor year 2016. 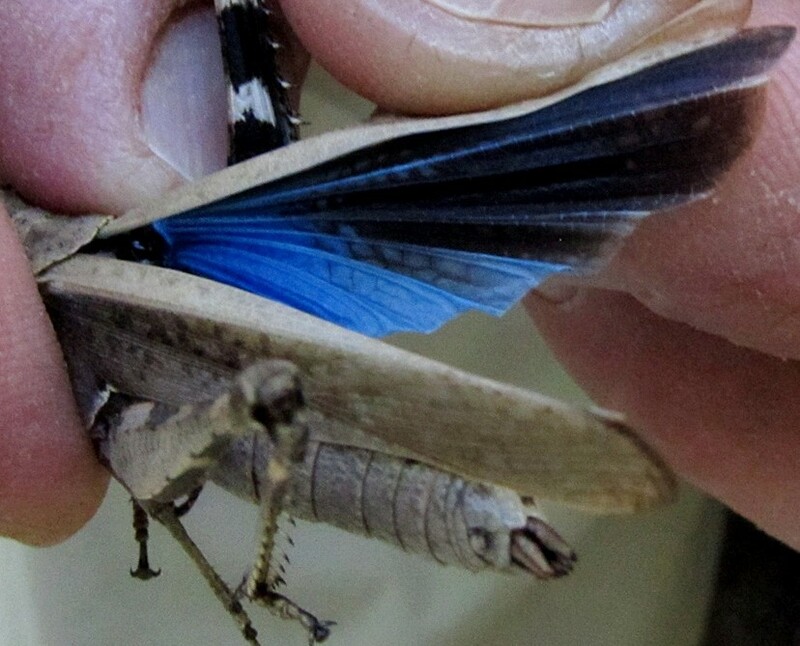 The species Machaerocera mexicana Saussure, 1859 (Mexican Blue-wing Grasshopper) was originally described from northern Mexico and has been recorded in Arizona roccasionally since it was found by UA students in 1972 at a location 3.2 km southwest of Patagonia, Santa Cruz Co., Arizona. 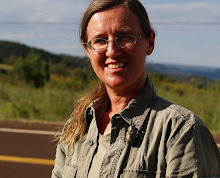 Sonoita. Since then, most records stemmed from las Cienegas (Pantano Wash) at the Empire state Ranch in Pima County. On an excursion to northern Sonora, Mexico wit Tom van Devender, I saw a few along a creek at Rancho las Avispas. That location is just south west of Nogales. Yesterday, with some birding friends, I went to Patagonia lake, strolling along the birding path to maybe see a Trogon. But it was very quiet, bird-wise. Only at the flat, muddy end of the lake a Kingfisher and a Great Egret provided a little activity, and the Trogon flew by after my birding friends had already given up. The further I followed the trail (maybe just a cattle path) away from the lake into the riparian forest of Willows, Cottonwoods and Walnut Trees, the more butterflies, dragonflies, wasps and grasshoppers I encountered. Mounds of decaying debris left over from many floods provide rich soil for many leafy plants under the shady canopy of the gallery trees. Cattle had added nutrients and churned it over - were doing so as I watched. I found tobacco plants as tall as myself and with huge leaves that could have wrapped cigars for giants. And from the knee-high level of tobacco and seep willow I scared up dozens of sizable grasshoppers with deep-blue underwings. Before they flew up, they went unnoticed despite their size - they were drab brown and sat very still. There were dozens in each location, usually mostly large females and a few smaller males. The flight of the females arched down after a few meters, but the little males flew very well and even up into my hair. 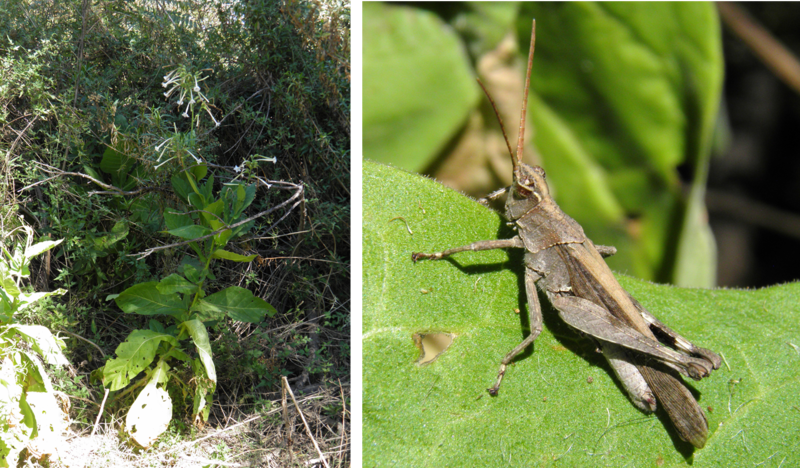 The grasshoppers occurred in solid numbers and in behavior (sitting knee-high in leafy plants, flying up nearly as a group) and wing color so distinctly different from other species that I'm surprised that they were so rarely observed. They are probably very seasonal (like most GHs), don't occur in places other than the limited habitat of a specific riparian forest, and maybe I just hit one of their boom years. But of course, I personally don't often feel like paying the steep price of $15 to get access to Patagonia Lake State Park. It seems that this location is quite close to the first US record in 1972. 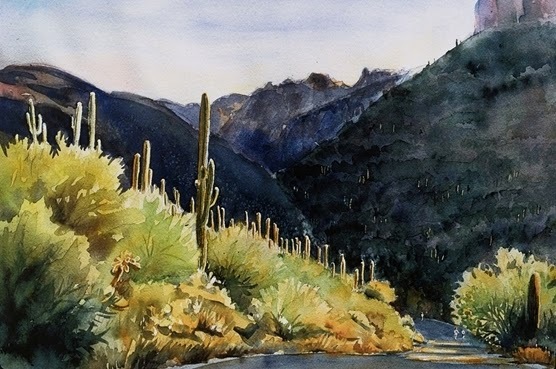 Lower Sabino Canyon, so safe and easy to walk but usually too busy with visitors, changes character at night. A little more wilderness, a lot more mystery. Very few people. The air seems to vibrate with cricket and katydid sounds and some that are tantalizingly close and distinct like the solo of a percussion instrument in a jazz band, but unrecognizable - at least to my companion, reptile photographer Rene Clark, and me. After dark, our observations began quite low key and prosaic with numerous visits to the little bath room buildings that dot the canyon. The wall of these Roosevelt-Civilian-Conservation-Corps-style buildings are made of natural stone and provide shade, niches and crevices for paper wasp nests, interesting spiders, Canyon Tree Frogs, and sleeping Canyon Wrens. Further up the canyon the creek was running, sounding fresh but smelling a little foul in places. Clear enough though to see Sunburst Beetles diving and Whirligig Beetles dancing in the beam of our lights. On shear rock walls we looked for Amplygids (Tailless Whip Scorpions) but found only a very nice tarantula. At night, the nose can become become more important than the eyes. I never realized the fresh, fruity smell of blooming Brickell Bush and until now, and I had only smelled Desert Lavender after I crushed the leaves. Yellow asteraceae along the water exuded a potent tagetes smell that instantly conjured up my mother's garden's marigold borders. 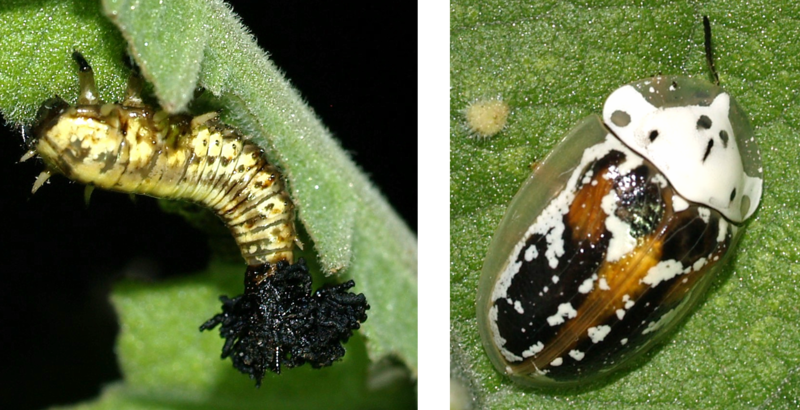 Most of the active responders were nectaring moths. We also found many paper wasps of at least 3 species. They nearly all turned out to be sleeping males that drowsily, but harmlessly crawled towards the cameras and onto our sleeves. Other insects relied on the warning the olfactory sense can provide: disturbed Pinacate Beetles interrupted their wandering and to stick their hind end into the air and when that wasn't enough to deter my probing finger I got doused with a staining, stinking gush of hydroquinons. Rather save from that night prowler, big sphingid caterpillars were stripping leaves from the riparian trees. I usually leave caterpillar expertise to expert friends like Dave Wagner. But one big cat was chomping on Ash, the smaller hornworm devoured Willow leaves. Though similarity to Rustic Sphinx on honeysuckle was noted, it was clear that these hosts would to entertain a different crowd. So knowing the family - Sphingidae, with horned 'worms', and the plant association made it easy to confirm my suggestion: the caterpillar on willow belonged to the eyed Sphinx Smerinthus saliceti and the larger one on ash was Sphinx chersis, the Great Ash Sphinx. Without noticing, we had covered nearly the entire length of the canyon. When we turned back, Great Horned Owls were hooting and a single firefly blinked in the canopy. We thought it might have been to late in the season for Poorwills that we usually hear at night. On the way back down we walked faster and did not plan on stopping a lot, when the Hooded Skunk marched into the road right in front of us. Amazingly, on the light tarmac, his long flowing white mane made him next to invisible in the moon light, a ghostly appearance that had us transfixed, except that our hands were frantically searching the right button on our cameras. He came directly towards us, very close. Alas, my camera's battery failed right when he was in reach of our macro lenses and Rene also mumbled something very disappointed. And after being flashed at once, he had had it and strolled off. Most amazing? None of us thought about being sprayed at that moment. The rest of the way was uneventful but good exercise. To tired to ponder why the mantis crossed the road. Home by midnight. A night well-spent. For Tucsonans, Finger Rock is an iconic part of the Catalinas. It is so recognizable that it often turns up in paintings, my own included. And every hour of every day presents a greatly different picture drawn by those dramatic shadows on the east-west expanse of mountain range. But when Rich Hoyer and the daughter of a friend and I hiked up Finger Rock trail on a sunny October afternoon, shade was in short supply. I should mention that Finger Rock trail does not actually attempt to reach Finger Rock. It skirts it in the canyon below. Butterflies defended territory, especially Empress Leilia. Dragonflies swooped overhead, a sign that not too long ago termites and ants had been swarming. Still, note to self and Rich: don't climb up a dry southern slope in Tucson in October with a 12 year-old in tow if you want to kindle said 12-year-old's out-door enthusiasm. You would have to come up with a much greater show of interesting bugs than we could find. 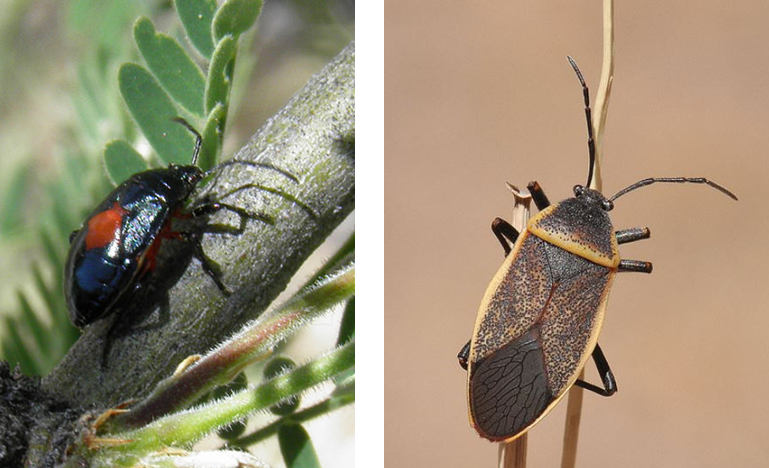 Always first hailed as beetles, then pronounced to be 'just' nymphs of a True Bug: little, fast shiny, early-instar all black and later red-dotted Largus offspring. As usual on warm days, a big Hippomelas sp. 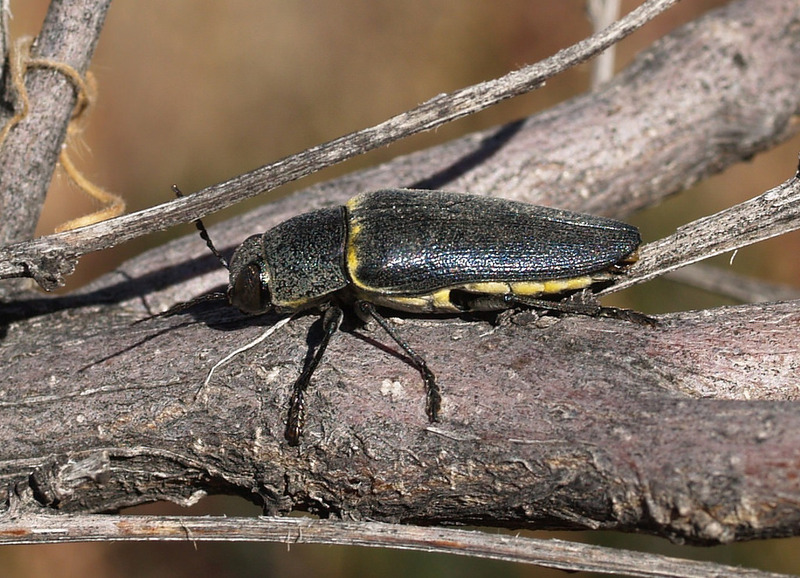 Buprestid was running and flying high up in the branches of a Mesquite tree. Always out of reach. Binoculars were the only way to get a glimps. Another species of Buprestids (Metallic Wood-boring Beetles), Acmaeodera gibbula, was found mating on dead twigs of Acacias. Eventually, the trail turned down from climbing exposed slopes to follow a dry creek bed. Rich had expected blooming asteraceae here. We found instead blooming Dodder (Cuscuta) a suffocating parasitic vine. I had never seen it bloom. Wasps and small bees seemed to like it. More wasps buzzed around another small-flowered plant. Too bad that the kid with us was afraid of 'bees'. Trying to rationalize this 'cultured' behavior. Maybe with a little success: Nobody ran screaming. 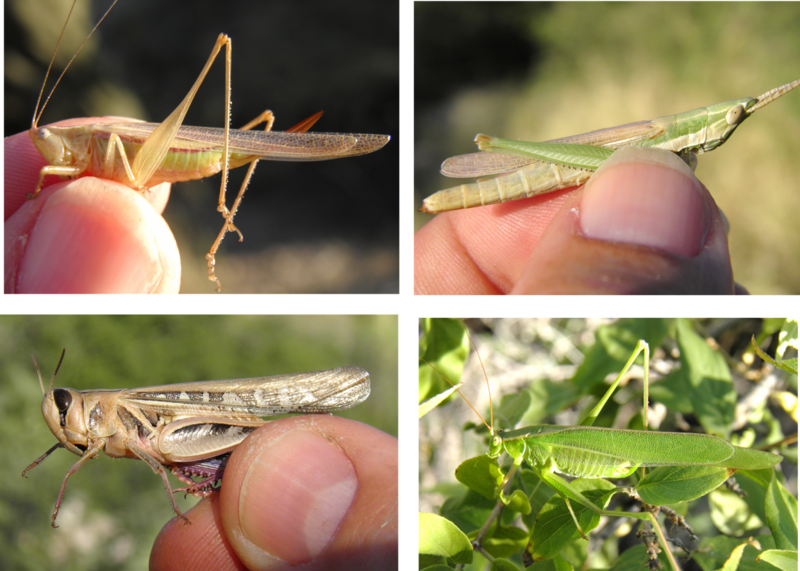 Bushes like Desert Hackberry had accompanied the entire trail, but only in the deeper parts of the canyon they were really lush and Mexican Bush Katydids were chomping away on fresh, juicy leaves. Patches of grasses in this protected spot finally revealed a number of grasshoppers and meadow Katydids. But while the diversity might have been pretty good - we spotted at least 5 species within minutes of loosely skimming around, there was no quantity. 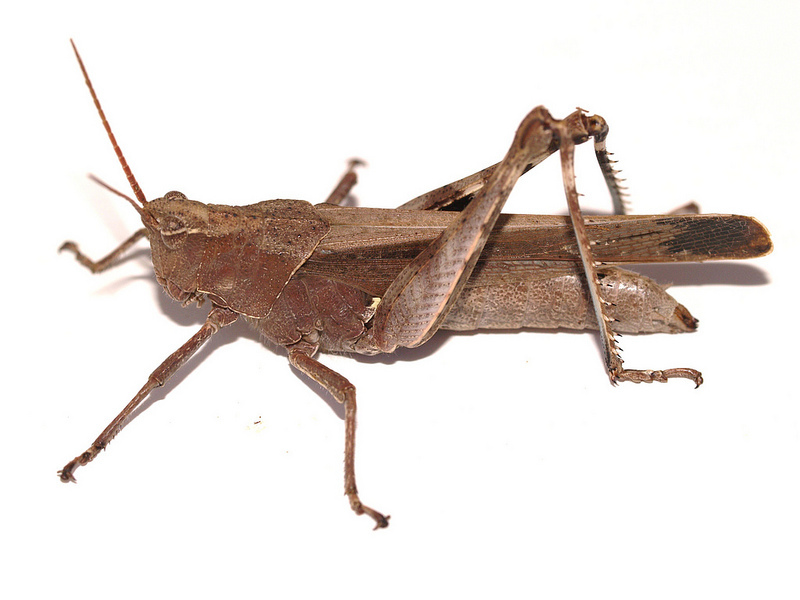 It's October and prime time for grasshoppers. What's going on? Just when I thought summer and the monsoon were behind us ... the temperatures during the day were back at 95 degrees Fahrenheit, the wind blew hard and I was very glad that I didn't take part in the art show in Patagonia as I usually do. But not during and election year, with this contentious one to boot. Instead I'm sitting at my computer organizing the beetle photos for the Arizona Beetle Book that Art Evans and I are preparing. I was just sending him my list of Elateridae and the one-thousands species when the dogs began whining, lightning flashed and thunder rolled. The sky opened, the mountains disappeared behind the deluge. Rain drummed onto the roof so hard that nothing else could be heard for a while. This lasted for probably half an hour. When it was possible to get outside, I checked the rain gauge. 2 inches! The washes were roaring and still raising. The water rushed so hard and fast that it seem to run above the banks for a while. But then it broke out of the beds and flooded the land, breaking new channels in it way. From the only wash I could get close to, I heard ominous cracking as if trees were torn down. whole trunks were racing by from our land into the state land. The road turned into a stream as well. My worry had been a big dead ironwood tree that had fallen into a wash last year and partly blocked it. Now I found that it had been ripped from its last roots and dragged down the wash. Probably the cracking and screeching that I heard. The force of the water had ripped it apart and big pieces were gone - the trunks that I saw floating by. But the main part of the tree had lodged itself into the sand far from where it used to stand. That wood is heavy! That, and it's hardness, is what gives the tree its name. 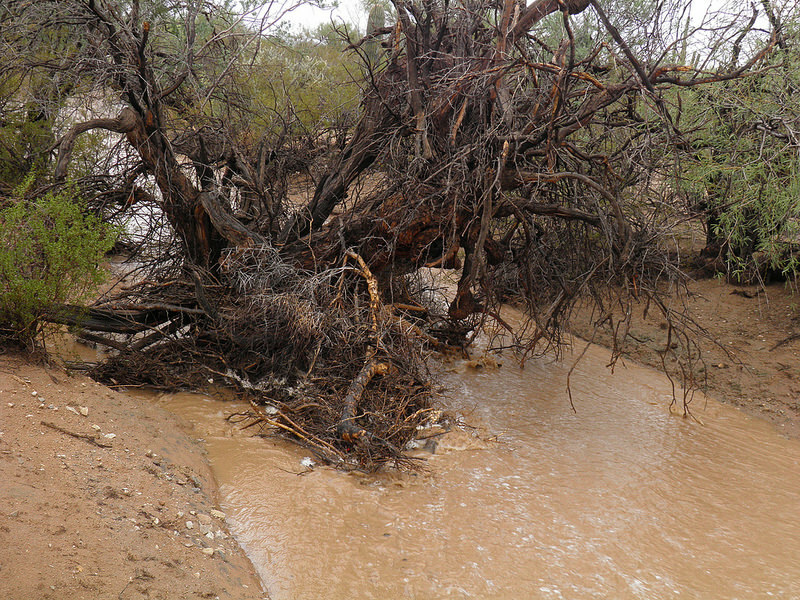 The living trees are all standing, but one ironwood and one big saguaro were badly under-cut by the water. The flood was extremely forceful and reminded me that building catch basins and canals to retain rain water are just wishful thinking here were the power of the elements can be so raw. The sun came through just before it reached the horizon. Storm cloud got gilded, then turned purple. Nearly as fast as the flood had come, it also receded again. By sunset I could nearly cross the closest wash again, but I gave up when the muddy bank started to give way. The end of September brought a feeling of autumn. Water in the creeks, cooler air, a wall of heavy clouds out south. Turpentine Bushes glowing when the sun did come out. The first flowers on Desert Broom open and buzzing with insects. But soon a heavy downpour drove us from the Proctor Road area. Big wasps of several different families braved the bad weather. Heavy-bodied, they always need fuel for their flight muscles. The two last ones are spider hunters (Pompillidae) Their prey is at it's prime right now. Some Caterpillars are still fattening up. I wonder if they will pupate and then pause until spring, or if a new generation of moths will still emerge this fall. Soldier Beetles feed on pollen and nectar (?). Flowers are also the meeting ground for couples. Several other species will still reach their peak later in October. The thunderstorm spared the higher part of the canyon. From the upper parking lot, we chose the Super Trail towards Josephine Saddle. At higher elevations, Most yellow flower disks were occupied by Buprestids (Metallic Wood-boring Beetles) in the genus Acmaeodera. I am collecting A. rubronotata for an ongoing study, but on this trip I mostly found A. amabilis, A. amplicollis and surprisingly many A. resplendens. A Rove Beetle had joined the Bups here - I think of that group as hidden by darkness - either being night active or living under logs (bark) and rocks. But in tropical Costa Rica and in humid, cool northern Europe, Staphylinids often chose exposed positions - sometimes mimicking hymenopterans (bees, wasps). 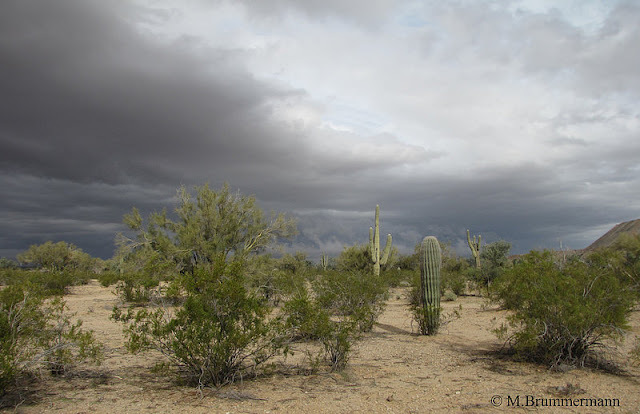 Yesterday the weather was unusually cool and humid for Arizona. So maybe the hidden live-style of AZ Rove Beetles is an adaptation to the usual hot/arid climate here. Their bodies do seem more exposed that those of 'normal' beetles covered by their elytra. At above 5500 feet elevation, few bees were active. This one was quietly hugging her perch, waiting for the next burst of sunshine. Leafcutter bees of HB size were also still milling around. Randy memorized some names of small, delicately patterned butterflies. Many nature lovers start with those obvious beauties and later learn to appreciate the more subtle appeal of for example beetles. So there's hope? We saw so many Red-bordered Satyrs that Randy joked that one was following me around, trying to lure me into the abyss. In fact, they seemed territorial and we kept trespassing. They perched rarely on flowers, but on the ground and in the low foliage of trees along the slope. Butterflies are considered beautiful by most. It takes closer observation to discover the beauty of some other orders of insect . I thought this Plant Bug (Mirid) in the genus Phytocoris as amazing in color and pattern as any Butterfly. But because of the lack of public interest in the group, and the fact that this species is of no great economic importance, there is probably no easily accessible literature to identify it, just as there is no common name. My faithful companions patiently waited for me to examine each and every flower along the trail. At least I did not turn every rock. But they never act bored. It so lovely to be out in this autumn weather. And here in Arizona, we are only at the beginning of another great outdoors season.